News story from Lincoln Journal Star, January 12, 2012. 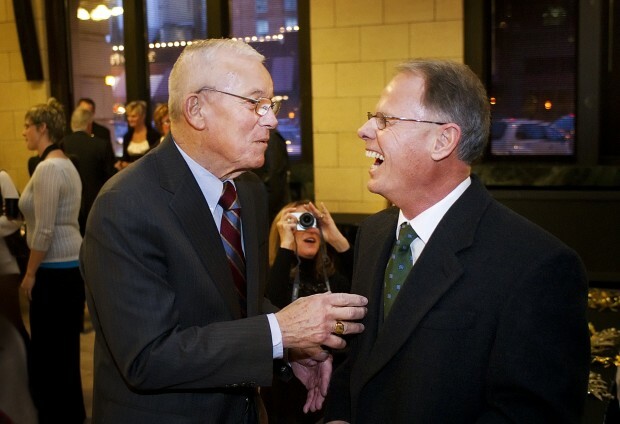 Frank Solich was back in Nebraska on a cold, windy night, but he never felt warmer. The former Husker coach was inducted into the Lincoln Southeast Hall of Fame on Thursday and many of his 1976 state championship football players were there to celebrate with him. Solich, who posted a 66-33-5 record in his 11 years at Southeast, also guided the Knights to another state title in 1977. He received a standing ovation from the crowd at the induction ceremony at the Great Hall in downtown Lincoln. "It was really great, even better than what I imagined it would be," said Solich, who will head back to Athens, Ohio, for the closing stretch of recruiting for Ohio University. "When I think back on my time at Southeast, those were probably the happiest times of my life in terms of the coaching profession. I had a great number of experiences around great people. "They influenced my career a great deal. I wanted to meet the basketball coach at the time, Wally McNaught. I decided that that was the guy I wanted to be my mentor in terms of what I wanted to be about as a coach and how to treat young men. "To this day, I still try to pattern myself after Wally." Solich came to Nebraska as a football player for Bob Devaney and after graduation, became football coach at Omaha Holy Name for two years before taking over at Southeast. He became the freshman coach at Nebraska, then served as an assistant coach, offensive coordinator and, finally, head coach for the Huskers. He was fired after the Huskers went 9-3 in the regular season in 2003. He took the Ohio University position in 2004 and guided the Bobcats to their first bowl victory this season. Ohio rallied from a late deficit to earn a 24-23 victory against Utah State in the Idaho Potato Bowl.